Dance4Fun specializes in Swing (East Coast, West Coast, Jitterbug, and Jive), Latin (Salsa, Mambo, Cumbia, Cha-Cha, Bachata, Merengue), Foxtrot, Nightclub 2-Step, Country 2-Step, Blues Dancing, and Line Dancing. Laura Rose conducts individual and small group, private classes. 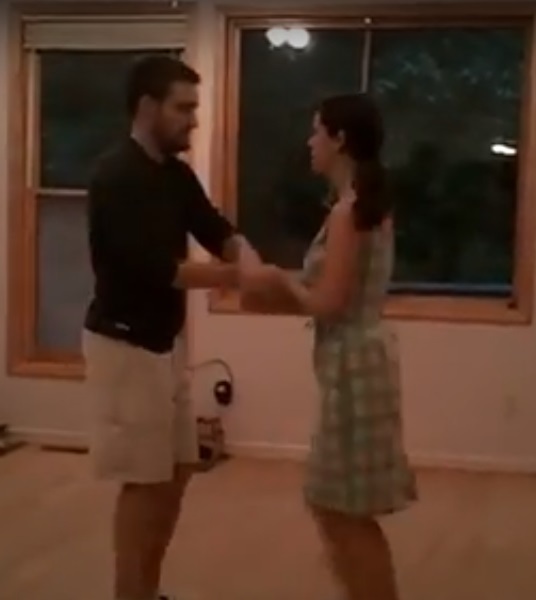 She can teach both the ballroom style and the more relaxed social partner style seen in most of the various dance clubs in the Raleigh/Durham area. Structured group and private dance instructions are taught in either a studio in the RTP/Durham area or at a home location of your choice. “It’s obvious that Laura puts a great deal of thought and preparation into her lesson plan.” “Footwork is clearly an important element of style to Laura”. Her emphasis on this is one of the things that sets her apart from some of her contemporaries.” “She starts each lesson with a warm-up consisting of a number of footwork alternatives designed to enhance the basic step.” “The way she integrates the new footwork enhancements into a repetitive warm up exercise is a great technique and a way to pack a lot into the hour.” “During the core skill sessions, Laura carefully chooses exercises and patterns that are effective at teaching the concept of lead-follow, so important to West Coast Swing and most other dance steps. Each new pattern is demonstrated with slower music at first, then students are challenged with a quicker score for repetition.” “Laura pays close attention to and is very patient with each student, regardless of the skill level they come in with”. “If she sees that a student is not moving through a new pattern quite as quickly as others, she will intervene as either the leader or follower to make sure the student reaches the breakthrough they are seeking.” And she does this efficiently so as to not hold up the class any more than necessary”. “Finally, Laura is careful to keep the class on task, while still allowing a little fun and mischief, but definitely completing her lesson plan and providing the value that her students are looking for.” Jim Barron, Ph. D.
Dear Laura; I have really enjoyed this round of private lessons, and I’m looking forward to playing with all the new moves! Thank you for your fund and adventure packed lessons! I will definitely give high recommendations if anyone happens to notice how much fun I’m having with West Coast Swing. Feel free to use my comments on your website or advertising. Warm Regards, Jenny Hubert. I want to thank you for so patiently helping me with my skills in West Coast Swing. I have enjoyed our time together. I also feel I have learned a lot from you! Last Saturday I actually did an ‘invitation’ with a dance partner other than Jim! I’ve had a good time with it, and he gave me a few invitations to play as a result. Thank you for helping me increase my confidence! Pat Spinner. Our nieces wedding was coming up and finally my husband John agreed to take a few dance lessons. Past lessons had intimidated him, so I knew I’d have to find the right instructor this time. Laura was the best and took a lot of time to understand our needs. For John, Laura took the few basic steps he already knew and showed him several “moves” based on what he already knew. She showed him how to work them into the music. She had him covering the floor with great “walking” steps. She stressed a strong lead that allowed John to control a person even when that follower tends to anticipate and back-lead (like I do). He learned several great arm turns that really took his dancing to a new level. At the wedding we had several people comment on how well we danced. That was a first and, of course, we both knew it was due to Laura’s lessons. I can’t say enough wonderful things about Laura. John has even said he might consider a few more lessons and that’s really the highest compliment. Barbara Dilon. We have an initial email or phone conversation about what their goals are, and dance experience. We discuss dance packages and schedules. Then we schedule a first lesson.